A new national police unit is to be established to tackle sectarianism at football matches in Scotland. The move was one of a number of measures outlined at a joint action group (JAG) hosted by First Minister Alex Salmond at Hampden Park, Glasgow. It was also confirmed there will be new codes of conduct for players, coaches, officials and supporters. JAG - which includes Celtic and Rangers - was set up after the so-called Old Firm "shame game" in March. The game, on 2 March, resulted in three red cards, several touch-line and tunnel confrontations and 34 arrests as Celtic ran out 1-0 winners. Strathclyde Police branded scenes at the match "shameful" and requested the Scottish government hold a summit to tackle sectarianism and disorder at matches. After the initial meeting on 8 March, an eight-point action plan was agreed by both clubs, ministers, footballing authorities and the police. The joint action group, which includes Celtic and Rangers, the Scottish Football Association (SFA) and Strathclyde Police, was set up to implement this. Image caption Mr Salmond described the meeting as "positive and productive"
Following Monday's meeting at Hampden, it was announced that the new National Football Policing Unit would be up and running for the new season, backed by £1.8m of government cash. This will allow Scottish forces to co-ordinate football intelligence and support post-match investigations. All SFA member clubs have agreed to adopt a single code of conduct for players, coaches and officials. The clubs have also agreed to a similar code for fans, with a commitment to impose and enforce sanctions against those who break the guidelines. Mr Salmond, who aims to pass new legislation to tackle sectarianism by the end of the year, described the meeting as "positive and productive". "The new high profile initiatives we have announced today, such as the National Football Policing Unit, codes of conduct for players and commitments to reschedule key matches will make an important difference," he said. "But this is only the beginning of the process. We have delivered on the eight-point plan before the new season begins. "The joint action group will now continue to meet over the course of the year to engage with supporters, and ensure the good work we have started continues into future seasons, so we can rightly take pride in our national game once more." It was also confirmed at the meeting that next season's New Year Old Firm derby would be rescheduled to Wednesday night on 28 December. 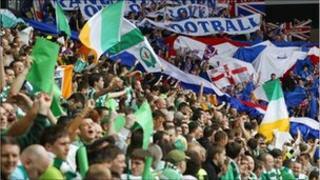 The post-split Old Firm derby match is to be scheduled in consultation with police before the post-split SPL fixture list is agreed. Next season's post-split SPL fixture list will include one mid-week fixture. Celtic chief executive Peter Lawwell said his club was "pleased" to play its part and welcomed recognition that some problems were beyond football. He said: "The report recognises that a number of the issues which have arisen in recent years cannot be put solely down to football. These are issues for society in general and must be considered closely. "We look forward to phase two of the process, where the club and our supporters' groups will be involved in the consultation process on the proposed new legislation." Rangers chief operating officer Ali Russell said his club was "100% on board" with the new approach being taken. "We support measures announced today that will make a difference to tackling anti-social behaviour associated with football," he said. "Our club willingly plays its part in addressing wider societal issues such as violence, alcohol and bigotry but these issues cannot be resolved solely by football clubs and we welcome the fact this is recognised by government." Other measures approved at Monday's meeting include the immediate implementation of a new protocol for senior police officers to brief players and coaching staff prior to matches. Changes will also be considered to the Alcohol Scotland Act 2010, which would allow licensing boards to alter pub and off licence opening times around matches . Legislation could also be introduced which would allow a senior police officer to request the courts impose restrictions of pubs and off licenses in an area where football-disorder is expected to occur. Video What do people in Glasgow think of proposed sectarian legislation?